A wild Sunday in the NFL brought one of the biggest weekends in the NFL calendar to a close, leaving us with just four teams left in the race to lift the Lombardi trophy in early February. On top of a wild finish in Minnesota, we saw plenty of key performances on both sides of the ball. With that in mind, here are the standouts from the divisional round weekend. Much has been made of the success of the Jacksonville Jaguars defense, and for good reason, but another big reason why they find themselves in the AFC Championship game is because of their offensive line. Center Brandon Linder didn’t allow a single sack, hit or hurry on 28 pass-blocking snaps, good for a 100.0 pass-blocking efficiency rating. It won’t come as much consolation to New Orleans Saints fans, but several key members of their roster once again delivered huge performances against the Vikings. From 38 pass-rushing snaps, edge defender Cameron Jordan racked up two hits and six hurries, good for a 15.8 pass-rushing productivity rating that was the highest at the position this weekend. Jordan wasn’t the only edge defender who had a big game this weekend, as New England Patriots pass-rusher Trey Flowers came up with a key performance in the win over the Tennessee Titans. Flowers produced a sack, two hits and three hurries from 31 pass-rushing snaps, resulting in a 15.3 pass-rushing productivity rating. 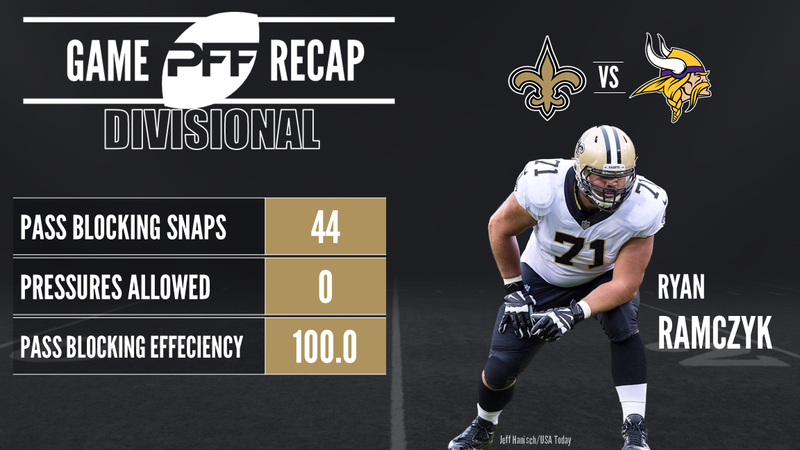 Another key part of the Saints’ future, rookie offensive tackle Ryan Ramczyk was outstanding against the Vikings, despite the end result. With zero sacks, hits or hurries allowed on 43 pass-blocking snaps, he produced a 100.0 pass-blocking efficiency rating. The Philadelphia Eagles shook off the underdog tag to advance to the NFC Championship game, and linebacker Mychal Kendricks was key to the victory with his play both in coverage and against the run. Kendricks came away with a pass breakup in coverage and registered two tackles resulting in a defensive stop, with one of those coming against the run. Atlanta Falcons running back Tevin Coleman saw just 11 touches on offense, but he made them count, forcing two missed tackles and averaging 4.7 yards after contact per carry. Resulting in an 85.5 elusive rating that led all running backs this week, plenty of Falcons fans are wishing they saw more of the football on Saturday afternoon. 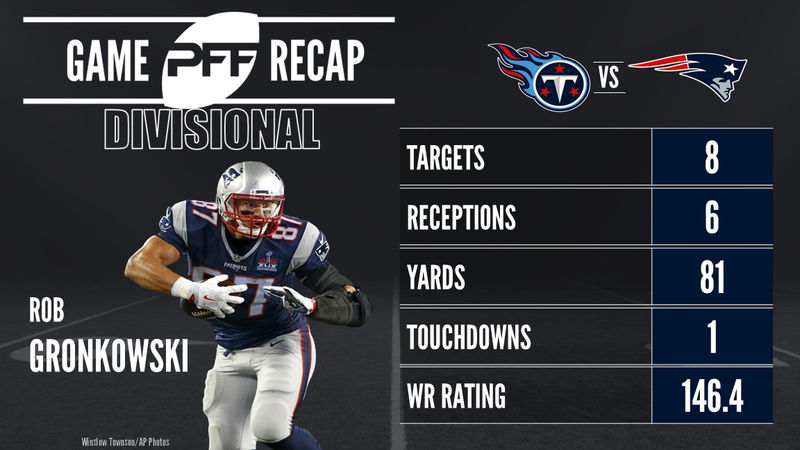 Continuing another impressive postseason, Patriots tight end Rob Gronkowski delivered a vintage performance with some big plays in the passing game and some key blocks in the running game. Gronkowski averaged 1.88 yards per route run, racking up 81 yards from 43 snaps in route. Eagles right tackle Lane Johnson wasn’t perfect in pass protection, allowing a hit and two hurries from 31 pass-blocking snaps, resulting in a 92.7 pass-blocking efficiency rating. He did, however, excel as a run-blocker, producing a PFF run-blocking grade of 93.3 that was the best mark of any player in the NFL this weekend. The hero of the weekend, Minnesota Vikings wide receiver Stefon Diggs delivered the play of the postseason so far with a walk-off touchdown to send the Vikings to the NFC Championship game. Producing 137 receiving yards from 38 snaps in route, Diggs averaged 3.61 yards per route run, the highest average among wide receivers in the Divisional round. Were it not for Diggs, it would have been Michael Thomas who was being celebrated today, scoring two second-half touchdowns to help the Saints into position for the comeback. Targeted 13 times, Thomas racked up seven receptions and scored two touchdowns. There was also an interception on a throw to Thomas, bringing the passer rating on throws to him down to 81.7.